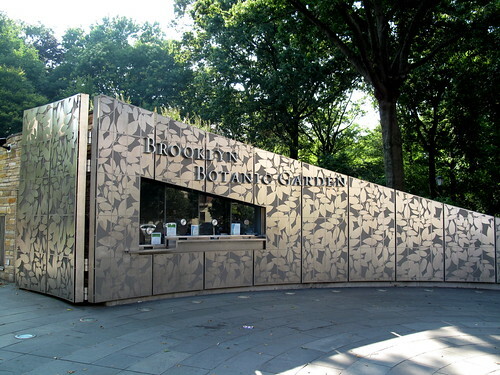 Friday we spent the afternoon at the Brooklyn Botanic Garden. From one extreme to the other. 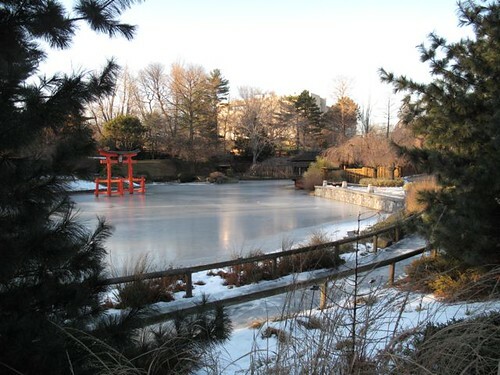 The last time I was here in January, it was too icy to walk around the pond, and there was no wildlife to be found, except for the birds. This time, it was hot hot hot. Since I’ve been here a few times before, I didn’t feel obligated to thoroughly explore, I just visited my favorite spots, and the pond is always the first place on my list. 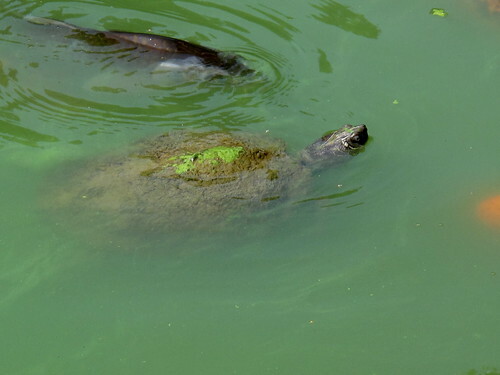 There are koi and turtles everywhere you look. They call this part of the garden the Japanese Pond and Hills garden. 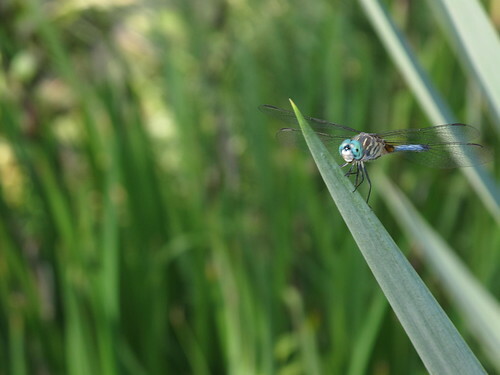 In the hills behind the pond, we spotted a praying mantis along the trail. I’ve never seen one in person, it was about three inches long, it was amazing. It leapt away right after I got the shot. 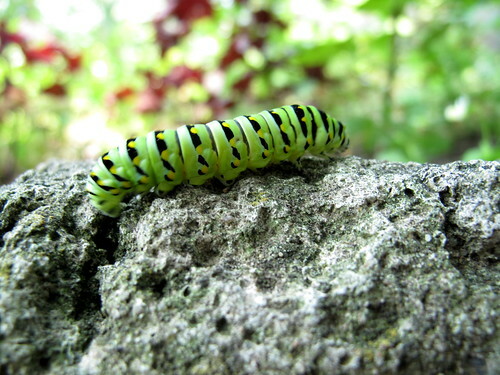 By the front entrance, by a vegetable garden, we sat down to recover from the walk in the heat, and spotted this caterpillar making its way down the stone wall. I haven’t seen such a fancy caterpillar in ages. Perhaps some wildlife is interfering with the plant life here. 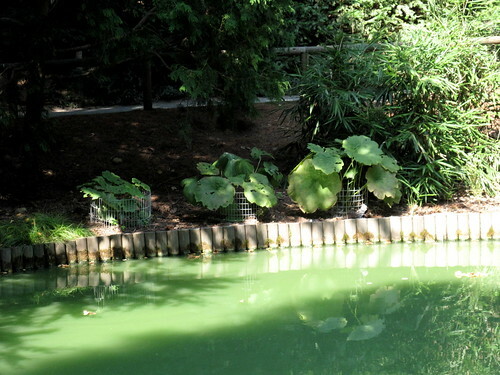 I couldn’t figure out why these plants were in cages, but I’m guessing one of critters that likes to loiter by the pond was having a nibble. All in all, a pretty good day for wildlife spotting in Brooklyn. That caterpillar sure does look like a monarch. Most pretty! Oh, everyone likes to be so fancy and stylish there in NYC, even the critters I guess. Amazing mantis shot! I’ve still never seen one, so you’re ahead of me. I think I might shriek involuntarily if I did, though. Fun visit to the botanical zoo! 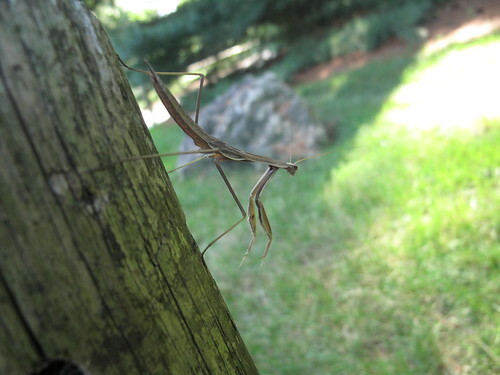 I Having grown up in a rural area we saw a lot of praying mantis. The most startling time was when one managed to get up my mothers pant leg without her realizing it…the next thing we knew she was in the kitchen and started dancing and pulling off her pants. Luckily the mantis was uninjured. Beautiful shot of the caterpillar!